Let’s start with the oldest pic I could find, from 2014. This is not my first paincave, but it is from a point where indoor training was becoming a serious part of the menu. Here we see my Trek Domane on my old, borrowed Tacx mag trainer, with newly fitted aero bars. This would have been a short while after my 2014 crash and shoulder/elbow injury, where I had trouble holding posture on the bike, so resorted to an aero position to try and take some strain off my left side. 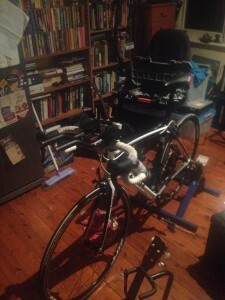 It helped, though the intensive physio was probably the thing that got me back on the bike ,really. 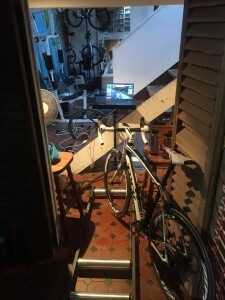 At this point, the bike was almost stock-standard, ran no power meter, and all interval sessions (Sufferfest, natch) were run off perceived exertion and heart rate data on a Garmin 500, and Analysed with Strava premium. The tile floor takes abuse a bit better than the previous wood floor, it must be said, and there’s a lot more space. The bike is now on a longer, more aggressive stem length and the aero bars are gone, but the pain cave is still fairly unimpressive. Aha! A first shot of the rollers. These are CycleOps Alu rollers, with the optional resistance unit, and the bike is my BMC Speedfox 29er. Objects of note here: Race numbers for motivation. Workstand to the left as a little confidence booster in case of crashing off the edge of the rollers while not paying attention. This was during a period where I was struggling a lot with motivation, anxiety and general fitness problems – see my post on Quitting The Road – and trying all manner of things to try and get back into the groove of things. I tried several different configurations during this time, but the nice casual nature of an MTB on the rollers was a very good thing to have. It’s very stable, and if you want t get used to rollers, you could do worse than to start with an MTB. Back to the road bike, and this is July 2016, during the Tour de France. 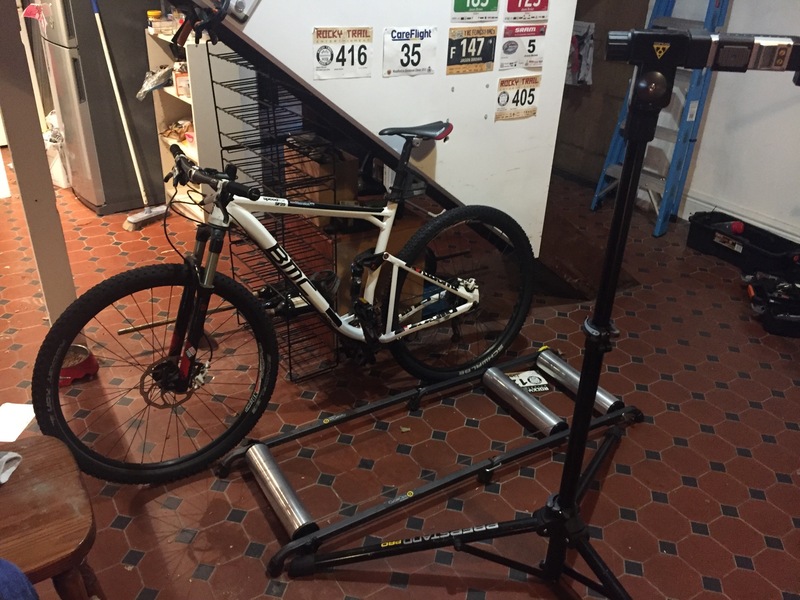 The new trainer is a Minoura VFS-150R gravity-frame trainer, with both Fluid and Mag resistance. The bike is pointed at the TV area, and there’s a tour stage on the screen even as this picture was being taken. That’s a home-made wooden riser under the front wheel. I didn’t used to need one until the long aggressive stem went on the bike, but nowadays it’s essential. My current trainers are slightly higher off the ground than old faithful, too, which doesn’t help. 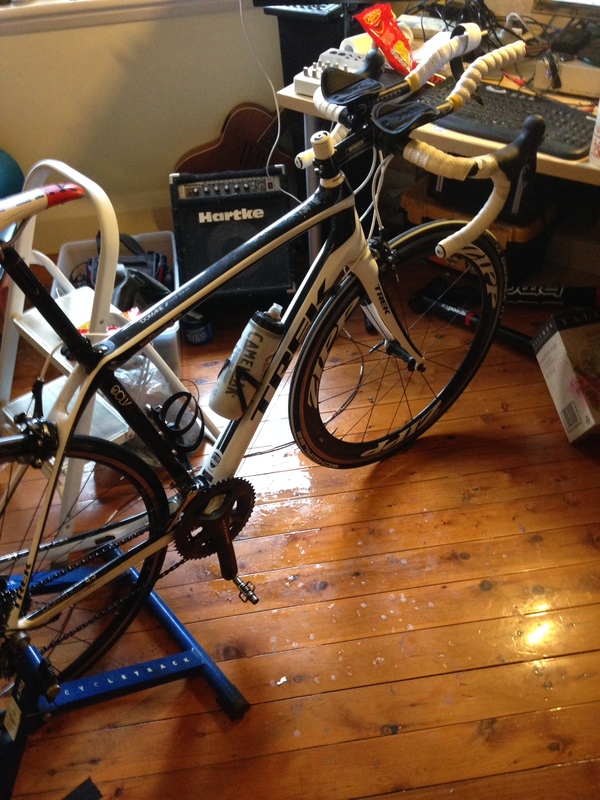 Not long after this pic was taken, I managed to destroy the Minoura trainer during a hard push up the Zwift Epic KoM. The effort twisted the resistance unit in its housing, bringing the housing into contact with the flywheel and exploding hard plastic casing all over my paincave. There were shards of sharp plastic turning up for weeks afterwards, and the trainer was dead. Properly dead. 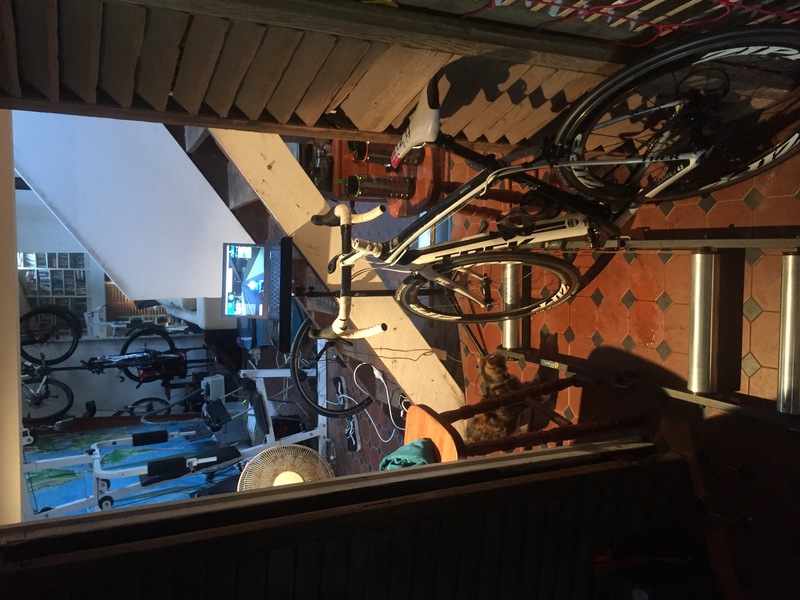 By the time of this pic, Zwift had hit the scene big time, and I was experimenting with Zwift on rollers. For optimum safety, I set up in my laundry doorway. There are only two doorways in my house, and one of them is at the top of the stairs, so the laundry was the only choice. The rollers are in place, set to a sensible resistance level, and the laptop is on a repurposed music stand. To either side are a pair of barstools with towel/bottles etc, and a fan. I used this setup on a few occasions and found the rollers gave a nice smooth power curve, and a good real world feel, and also didn’t aggravate my ongoing shoulder niggles like a static trainer did. So this became my favourite setup. It’s rather tough on tyres, but as you can see I’m using my favoured race tyres, Schwalbe Ultremo 2.3 on there in the test. Not exactly ideal but at this point I was short on spares and in desperate need of some kilometres. And here we see the roller configuration in its more permanent home. Wall on one side, multigym on the other. Fan and laptop stand. 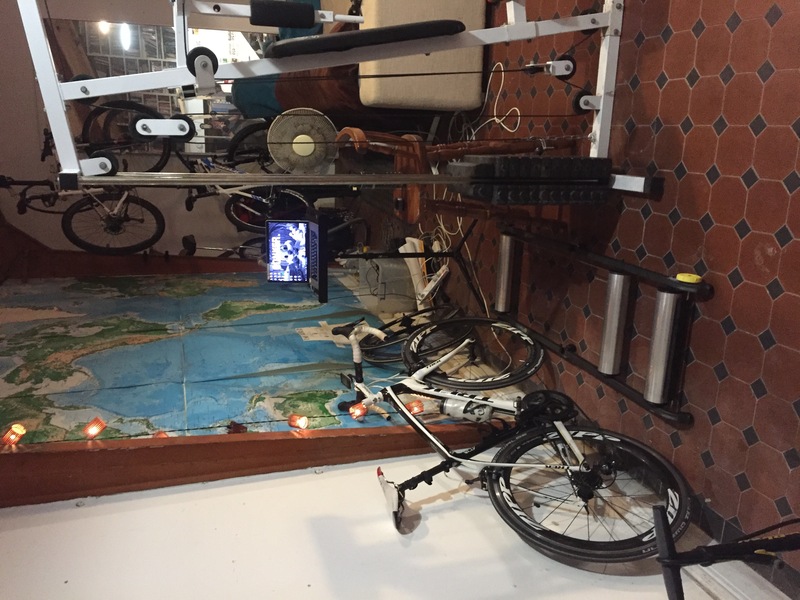 A neat little solution and really nice for recreational Zwifting. 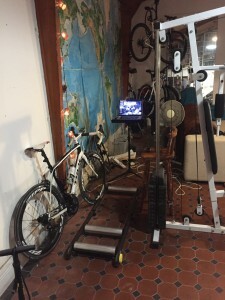 I also don’t need to fiddle around changing wheels and skewers if I don’t feel like it, and the multigym is right there if I feel the need to exercise my still-dodgy shoulder. I can even see the TV from where I am, so boredom is not a problem. Not pictured is the Flag of Sufferlandria, which was flying just over my left shoulder as I was taking the picture. 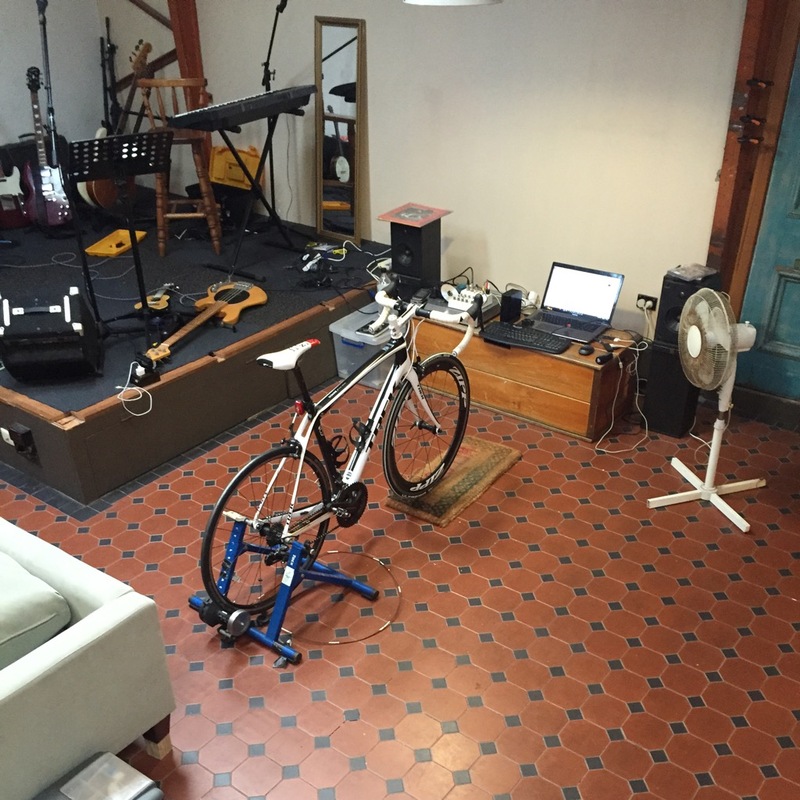 It’s not particularly easy for me to stay properly hydrated on rollers at the moment – though some people can make omelettes while up there – so I also run an Elite Qubo fluid trainer in another part of the warehouse, facing my standing desk, for Zwift races and hard Sufferfest interval sessions. 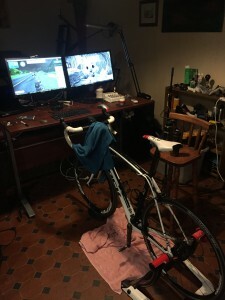 My desk runs twin monitors, ostensibly because I’m a techie and a power user, but actually so I can Zwift at the same time as watching old episodes of QA or recorded bike races as I roll. The pic was taken just after a Zwift KISS Americas AM race, where I classified third second in grade. 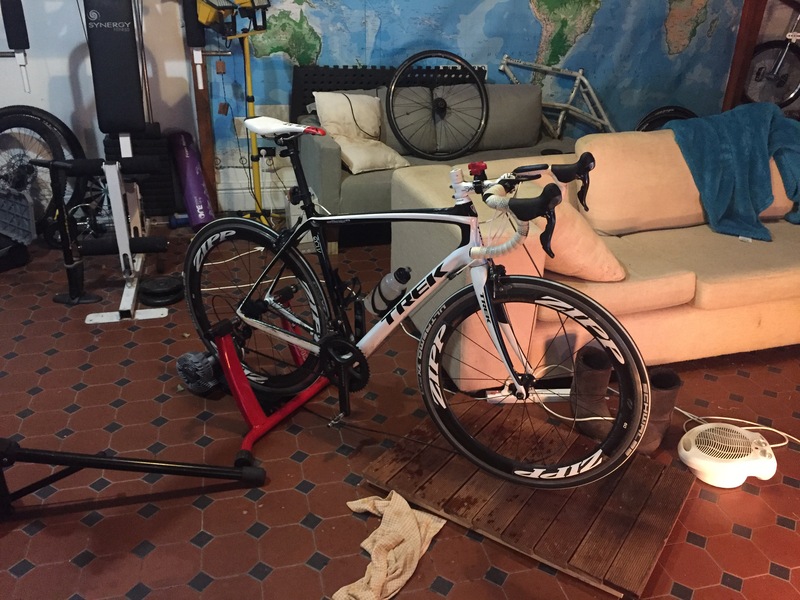 There’s much less chance of crashing on a static fluid trainer than with rollers, though I have in the past managed to crash a turbo trainer in my own house. If I remember correctly, I was doing about four hours or so of Sufferfest intervals and went sufficiently deep on a long interval that I lurched off to one side and tipped the trainer over entirely. Which was nice. 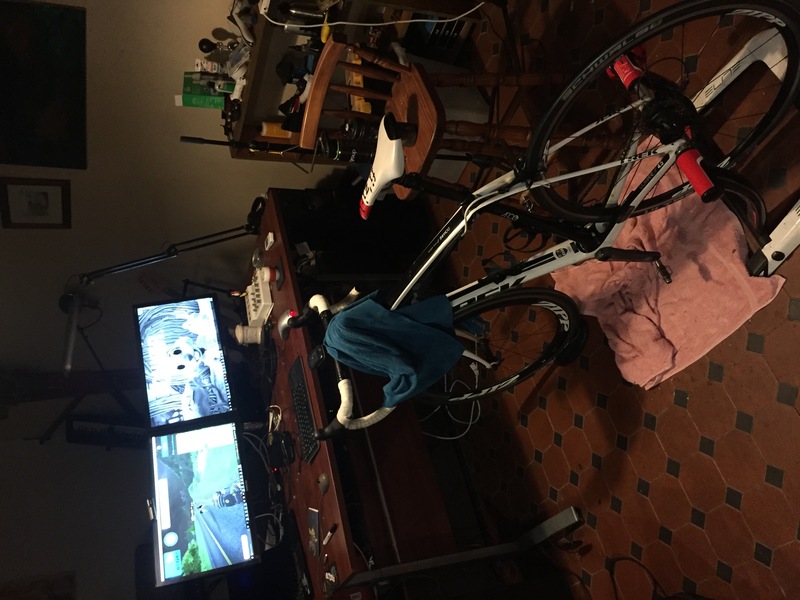 Anyway, thank you for indulging my paincave nostalgia and feel free to post your own setups over on the Zwift.community thread. I’d be intrigued.